Historically, steel tanks were made from galvanized iron which was largely phased out with the introduction of zincalume (a mix of zinc and aluminum). Most steel tanks today (apart from stainless steel tanks) are made from a product developed by Bluescope called Aquaplate steel. This material has a food-grade polymer skin bonded to the inner surface of the tank. Please see the Price Comparison for price estimates. Aquaplate tanks are guaranteed for about 20 years and will most likely last well beyond this timeframe (galvanized and zincalume tanks tend to corrode after about 10 years). The inner coating of Aquaplate steel tanks is designed to prevent corrosion of the steel. It is important, therefore, to ensure this inner lining is not damaged during either construction, installation or through cleaning and maintenance. One advantage of steel tanks is that they can be custom-made to many shapes and sizes and are light and easy to transport. Aquaplate steel tanks come in either a "galvanised" finish or a pre-painted Colourbond finish in a large variety of colours. Zincalume tanks may leach excess concentrations of zinc. This is not considered a risk to health although it may affect the taste of the water. 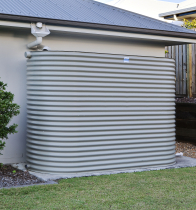 Aquaplate steel tanks are considered safe for the storage of drinking water as they also comply with the requirements of Australian Standard, AS 2070. Depending on their condition, most steel tanks can be recycled at the end of their life. Even if a steel tank ends up in landfill, it is a relatively benign material. It is recommended to place steel tanks on a reinforced concrete base. Tank is probably over 40 years old and is in excellent condition. The tanks were bought to fit a space that a poly tank could not. The only issue has been when they were recently moved to allow work, the Aquaplate base had been damaged in the transit or install and there was some small evidence of rust or bubbling under the external plastic coating. This was cleaned and repaired, then recoated with a rubber-based paint.